We just love the I Can Read books that pertain to Christian subjects. My son, who is now seven, is at the age that he is asking a lot about the bible and things related to it! Often times, he asks such deep questions that I have a hard time answering. The I Can Read books are perfect for him because he can read them himself, and then ask me any questions he may have. 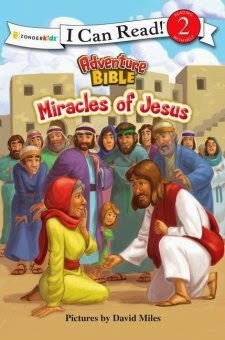 The latest book we received was, I Can Read Miracles of Jesus. I love this book because it is a level two book which is very easy for my son to read and understand but it also provides pictures so he can kind of put a face with the names he hears so much about in church. This book is beautifully illustrated, and well written. It definitely kept my son entertained for the time he was reading and gave facts that were appropriate for his age! Each page has only a couple of sentences so it is definitely a quick read, but my son did enjoy it, and I personally love for him to have God based reading materials.